There was a time when I was known as a shopaholic. I still have trinkets adorned with cute little purses and shopping mottoes as evidence of my former passion. 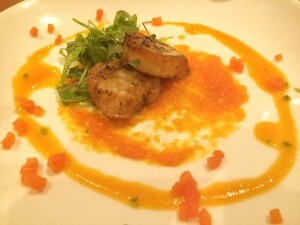 My addiction to restaurant dining surpassed shopping years ago, which seems to me like a much more palatable pastime. 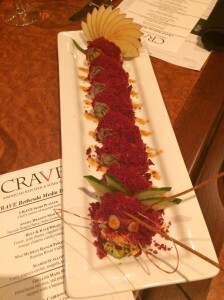 I recently attended a media dinner at the new CRAVE American Kitchen & Sushi Bar situated in Bethesda’s Montgomery Mall. If there’s anything that can tempt me back to becoming a more frequent shopper, it’s a mall restaurant with appealing decor and interesting food and libations. I invited my friend Joan Most, also known for her love of food, to join me at the dinner. Her impressions are included in this post. The menu at CRAVE is varied. An entire section is devoted to sushi, which is where I find myself lingering. 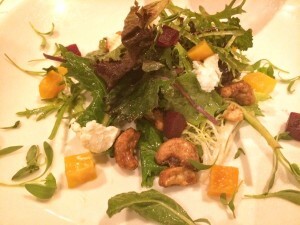 There is also a section of flatbreads, burgers, soups and salads, pasta and seafood, grilled items, and signature dishes. 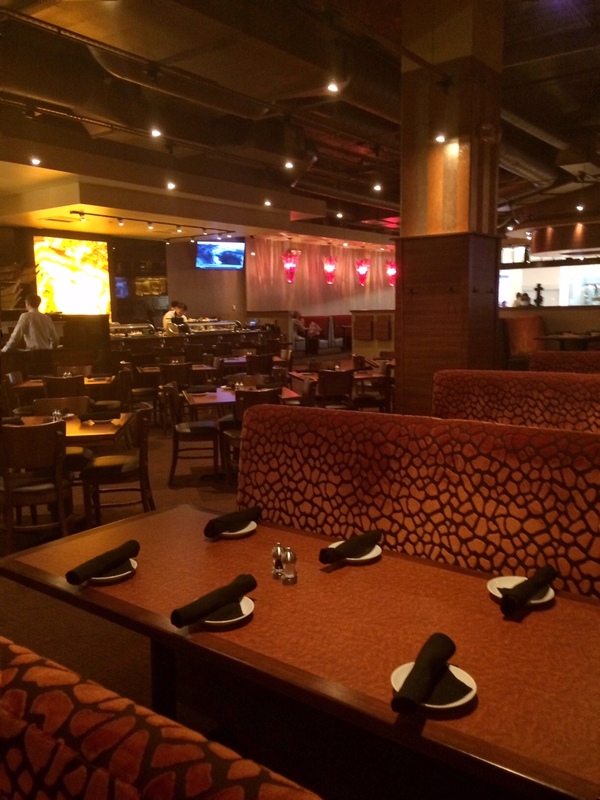 CRAVE is part of a restaurant group with locations in Minnesota, Florida, Nebraska, Nevada, Ohio, and Texas. Executive Chef Joel Hassanali comes to Bethesda from CRAVE Omaha. He is originally from the Caribbean, and he seizes the opportunity to put his own innovative spin and cultural influences on the dishes. Shopping after drinking alcohol could have serious consequences, but it’s hard to resist the extensive cocktail menu at CRAVE. Blueberry Lemonade with Stolichnaya blueberry vodka, mint, and fresh blueberries is a deliciously refreshing starter. Joan enjoys an Angry Dragon Martini adorned with a citrus rim. She’s confused about why it’s named Angry. “It was clearly friendly to me,” she says. Sushi at CRAVE is fresh and creative. 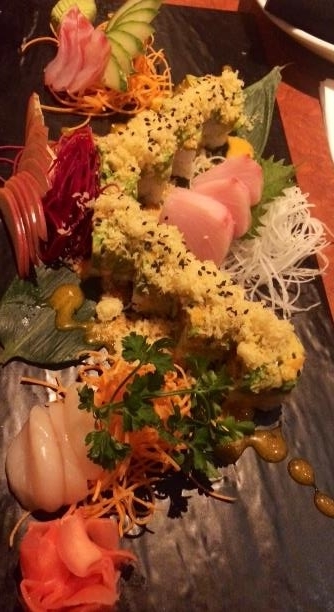 Joan, a sushi aficionado, declares it a hit. 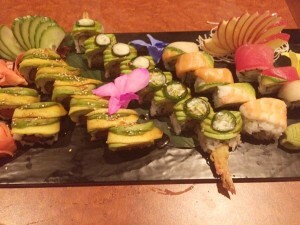 Favorites include the Bamboo Bite (crunchy tempura shrimp, cream cheese topped with avocado, thin slices of jalapeno, with hibachi and unagi sauces), the Caterpillar (spicy tuna, smelt roe, cucumber, mango, avocado, and sweet sauce), and the Rainbow Roll (California roll topped with chef’s selection of four types of fish). There’s also an adorably festive presentation of spicy lobster roll with wild berry beet crust, which is my personal favorite. Are we tired of kale? How about kale with beets and goat cheese? Many say yes, but I’m not among them. The CRAVE version is highlighted by candied cashews sprinkled lightly with cayenne pepper, and a lovely orange cilantro citrus vinaigrette. Seared scallops with curry papaya caviar, arugula, and papaya gastrique will be an addition to the spring menu as an appetizer. 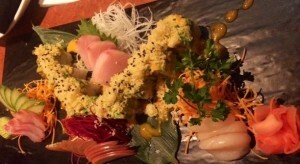 It’s a memorable dish, which I will certainly put on top of my list for a future visit. Although I rarely order steak in a restaurant, Medallion Duo with potato puree, grilled asparagus, and green peppercorn demi is also excellent. Tea drinkers take note. 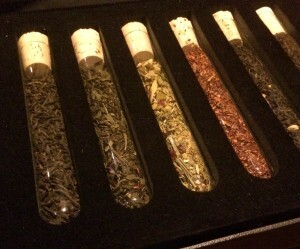 Tea options are presented in vials, and then brought to the table in a beautiful carafe. It’s nice to see a place where coffee doesn’t get all the attention. Desserts are available as miniatures- lemon meringue with blueberries is our favorite. Joan says the coconut cake is the best she’s ever tasted. I like CRAVE and imagine I’ll find myself here again in the near future. I find the sushi to be particularly crave-worthy, and best of all pairs perfectly with a visit to Nordstrom.